In a normally distributed set of data, all three measures of central tendency are approximately the same. 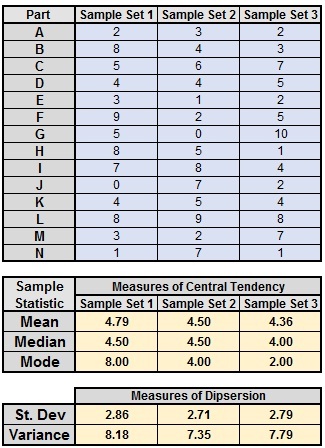 Calculations for measures of central tendency using the sample data are shown below. Since most populations exhibit normality (bell-shaped curve) or can be assumed to be normal, the mean is the most common measure for central tendency. It is used to describe normal data. In the example, the mean is of a sample, represented by x-bar. The median is the midpoint, the middle value or observation of the data set. If the set of data has an even count, the median is the average of the middle two values. 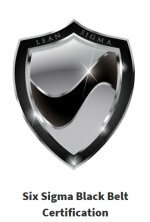 The is measure for skewed or non-normal data. Since the sample is an even set of data (10 samples) and the middle two values are 7 and 8, then the average of the two middle values is 7.5. The mode is the most commonly occurring value in the data set. Not commonly used as a measure of central location but can be found in the tallest bar of a vertical histogram chart. Measures of dispersion are numerical statistics which describe the spread of data or the width of the distribution. For the Standard Deviation, Excel uses "n-1" in the denominator to calculate the sample statistics (the rows in Excel for the data were in rows 3-16).